Phu Quoc is ringed with some of most beautiful beaches in Vietnam, and offers the best seafood in the country. 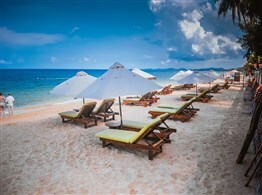 Phu Quoc island and its beaches was voted to be "The Most Cleanest and Beautiful Beach of World" by ABC News as from the end of February, 2008. Bai Sao is located on a private gulf so that there is always small rippling emerging on the coast. Sand has a spotlessly white color and sea is pure as crystal. 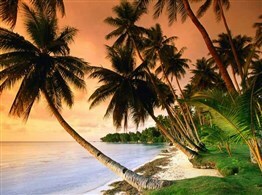 This is one of seaside resort still reserves its natural beauty. Pick up at your hotel and transfer to the airport for your short flight to Phu Quoc. Upon arrival, pick up and transfer to your hotel, check in and free time at leisure. One of Vietnam’s star attractions, mountainous and forested Phu Quoc is a splendid tropical getaway set with soft secluded beaches, the water a thousand different shades of turquoise. Stunning sunsets, thunderclouds heaped on the horizon. Palm trees protruding perpendicular over the gentle waves.That's Phu Quoc island and paradise for Vietnam beach lovers and great place to end your amazing Vietnam Holiday. Days free at leisure. Overnight in Phu Quoc. Free until we transfer you to the airport for your flight to Ho Chi Minh and connect with your departure flight. We hope that you have enjoyed your time with us and look forward to welcoming your next Vietnam Tours. Vivutravel says goodbye and see you again!! !